Background: The investigation of personality characteristics and emotional experiences of the people suffering from anxiety disorders is one of the most important issues which are considered by researchers and clinicians. Perfectionism, sensitivity to interpersonal rejection, and anger are personality traits related to social anxiety. In social anxiety disorder, it has also been focused on anger as a personality characteristic and as an emotional condition. The main purpose of this work is to investigate the role of these variables in predicting social anxiety among a nonclinical group of Iranian students. Methods: In this cross-sectional study, 131 students completed the self-report version of Liebowitz Social Anxiety Scale Self-Report version (LSAS-SR), Frost Multidimensional Perfectionism Scale (FMPS), Interpersonal Sensitivity Measure (IPSM), and State and Trait Anger Expression Inventory. Multiple linear regressions were conducted to examine the concurrent associations between perfectionism, interpersonal sensitivity and quality of emotional experience, and expression of anger with severity of self-report social anxiety. Results: Greater levels of FMPS total were significantly associated with a greater level of LSAS total, fear, and avoidance of social and functional situations (P = 0.022, P = 0.024, and P = 0.006). Moreover, a significant positive correlation between IPSM total (P = 0.015) with fear and also between anger expression index (P = 0.009) with avoidance subscale were found. Conclusions: In accordance to the previous researches, we found that perfectionism, interpersonal sensitivity, anger experience, and anger expression skills are related to social anxiety. How these personality traits are related to fear and avoidance of social situations and their concurrent effects on predicting social anxiety were discussed. All the people have a basic drive for getting touch with others, being loved, and respected by them. In fact, the most horrible fears are the worry about, not to be loved, and being ignorant of other people. Considering the importance of social communications, the human beings are naturally feared of being assessed negatively by others. In general, maladaptive expression of this adaptive concern is called as social anxiety disorder (SAD). The main core of this disorder is the intense and constant fear of one or some social or functional situations in which embarrassment, rejection, or scrutiny are possible. This fear leads to avoidance of the situation or endures it with sever anxiety or distress. One of the most important issues regarded by researchers and clinicians is to investigate personality characteristics and emotional experiences of the people suffering from anxiety disorders. Personality traits are partly permanent characteristics, affecting the individual's thoughts, emotions, and behaviors. Among these traits, some of them are more related to mental disorders and are known as risk factors or vulnerabilities which can mediate the development of psychopathological conditions and/or maintain symptoms. The presence of these characteristics with negative experiences and stressors in the person's life can lead to developmental disorders or/and maintain the symptoms. Perfectionism and sensitivity to interpersonal rejection are two personality traits related to SAD which are concerned by researchers and clinicians in recent decades. Anger has been also focused on as a personality characteristic and also an emotional condition in anxiety disorders. The experience and expression of anger can fall the people suffering from SAD into a difficult situation. Although the anger may be stimulated by perceived negative evaluation,, if expressed, it may increase the real or imaginative risk of more negative evaluations. Thus, the anger can be the trigger of anxiety and would be suppressed to reduce anxiety. In Erwin et al. study, in comparison with a nonanxious control group, people with SAD reported the higher levels of overall anger experience, anger in response to the perception of negative evaluations, and also anger suppression. Perfectionism is a personality trait which is known by a strong need to achieve the high standards of performance with over self-criticism. The studies show that perfectionism is understood more in multidimensionally conceptualizing framework.,, Frost et al. illustrated six dimensions of perfectionism such as (1) personal standards (PSs), (2) parental expectations (PEs), (3) parental criticism (PC), (4) concern over mistakes (COMs), (5) doubts over actions (DAs), and also (6) organization (O). Perfectionists' beliefs are regarded to have an important role in the development and maintaining of SAD. Several investigations show that the patients suffering from social anxiety consider high PSs for themselves to achieve predicted social standards and avoid shame.,, However, they believe that they never achieve these standards. As a result, fall into a vicious cycle including prediction of failure and rejection which lead to the avoidance of social relationships. Moreover, the studies in this field show that the dimensions of CM, PC, and DA can predict the group differences between the cases with SAD and nonclinical group., In an Iranian nonclinical group, there was a positive correlation between social anxiety with CM and DA dimensions. Social Anxiety was also negatively related to PE. The sensitivity to interpersonal rejection is a construct which is known as a basic component in psychopathology of SAD. Boyce and Parker have introduced this construct with the name of interpersonal sensitivity as a susceptible variable for depression. They also made an instrument for measuring it. The studies also illustrate that the level of interpersonal sensitivity can predict social anxiety.,, Despite all of this evidence, at least in one study, no relation was found between social anxiety and interpersonal sensitivity. In spite of the importance of these personality characteristics in social anxiety, few studies have been conducted to investigate their role in psychopathology of SAD. In addition, it seems to be necessary to repeat these studies among different population and cultures. Confirming the relation between these variables and social anxiety can be helpful to generalizability of these psychopathological relations in varied communities. Moreover, it has not been yet studied the simultaneous role of anger, perfectionism, and interpersonal sensitivity in predicting social anxiety. The aim of this investigation is to study the relation between social anxiety with interpersonal sensitivity, anger, and perfectionism and also the role of these variables in predicting social anxiety among a nonclinical group of Iranian students. Considering the results of previous studies, we hypothesize that these personality traits are related to fear and avoidance of social and functional situations. In this cross-sectional study, a total of 131 nonclinical students of the Isfahan University of Medical Sciences, Isfahan, Iran, during 2015–2016 educational year were selected through multistage sampling method, considering the gender, faculty, and major. They all consent to participate in the study and were asked to complete Liebowitz Social Anxiety Scale Self-Report version (LSAS-SR), Frost Multidimensional Perfectionism Scale (FMPS), IPSM, and State and Trait Anger Expression Inventory (STAXI-2) Questionnaires. FMPS scale was designed on the basis of multidimensional concept of perfectionism and includes 35 statements and 6 dimensions as followed; concern about mistake (COM), doubt about the action (DA), PEs, PC, PSs, and organization. In Iran, reliability and validity of this scale have been confirmed. Anger control-in (AC-I) evaluates the frequency in which the person controls his/her anger by relaxation or reconciliation. Data were analyzed using the Statistical Package for the Social Sciences (SPSS) Statistics version 22.0 (IBM Corp, Armonk, New York, United States). The Pearson's correlation coefficient was used to examine the relation between independent variables and total score of LSAS and its subscales. To assess the relative contribution of each independent variable on the variance of social LSAS-total scores and its subscales, multiple linear regression with backward elimination variable selection was performed. Most of the participants were female (22.9%), single (76.3%), and B.S. students (71.0%) and their mean (standard deviation) age was 22.40 (2.55) years. Pearson's correlation coefficient [Table 1] showed that among the subscales of STAXI-2, S-Ang, AX-out, AX-In, and AX-Index had positive correlation with LSAS avoidance score. Anger expression-in and anger expression-out had negative correlation with the mentioned score. 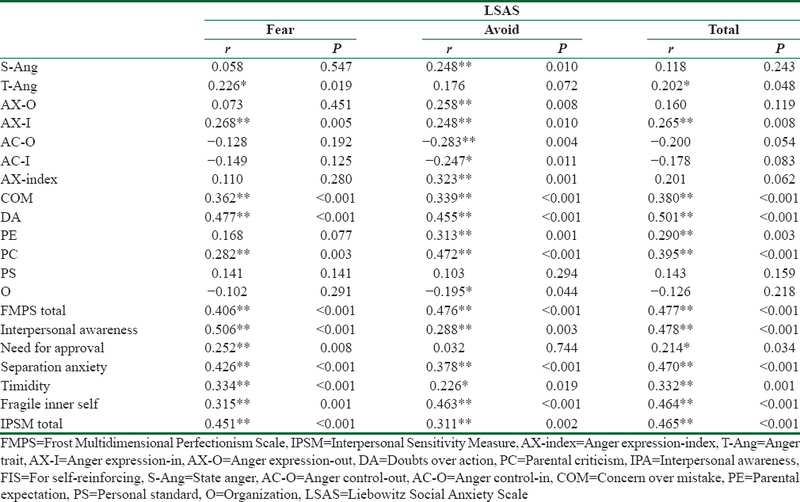 T-Ang and AX-In had a significant positive correlation with fear score and LSAS total. There was a significant positive correlation between FMPS total score and also CM, D, and PC subscales with fear, avoidance, and LSAS total score. PE had a significant positive correlation with avoidance and LSAS total score. In addition, there was a significant negative relation between organization and avoidance score. Among IPSM subscales, there was a significant positive correlation between the need for approval and LSAS-total score. The rest of subscales and also IPSM-total score had a significant positive correlation with all three LSAS-total, fear, and avoidance scores. Then, multiple linear regression [Table 2] showed that among the variables in the model, the total score of FMPS had a significant positive correlation with LSAS-total and also fear and avoidance subscales (P = 0.022, P = 0.024, and P = 0.006, respectively). Moreover, a significant positive association between IPSM-total (P = 0.015) with fear and also between AX-Index (P = 0.009) with avoidance score was found. Finally, [Table 3] showed that among STAXI-2 subscales, AX-I had a significant positive relation (P = 0.023) with LSAS total score and AC-O had a negative correlation with it (P = 0.027). T-Ang (P = 0.045) and AX-I (P = 0.032) had significantly a positive relation with fear. On the other hand, the AC-O had significantly a negative relation with avoidance (P = 0.009). Among FMPS subscales, the DA had significantly a positive correlation with LSAS total score fear and avoidance (P< 0.001, P < 0.001, and P = 1002, respectively). The PC had significantly positive relation with LSAS total score and avoidance (P = 0.025 and P < 0.001, respectively). Among IPSM subscales, interpersonal awareness with LSAS-total and fear (P< 0.001 and P = 0.019, respectively) and fragile inner-self with avoidance (P< 0.001) were related to each other significantly. The goal of this research was to study the relation of social anxiety with perfectionism, interpersonal sensitivity, and the quality of experiencing and expressing the anger and also the role of these characteristics in predicting social anxiety in a nonclinical case group. According to the results, the people experienced more anger in a situation (S-Ang) and their styles to express anger were more maladaptive (AX-I, AX-O), tried more to avoid anxiety-provoking situations. On the other hand, the people having more ability in controlling their anger toward other people (AC-O) and objects and also in controlling their inner sense of anger through relaxation or reconciliation (AC-I), avoid functional or social situations less. Furthermore, the persons being more prone to experience anger within the time and without specific stimuli (T-Ang) have more fear of functional or social situations. Multiple regression analysis showed that experiencing anger in different situations and without the presence of specific stimuli (T-Ang) accompanied with suppressing anger (AX-I) predicts 16% of fear of functional or social situations. Inability in anger controlling and directing it toward other people or objects explains 13% of avoidance score. Anger suppression (AX-I) and inability in controlling aggression toward other people and objects (AC-O) clarify 11% of LSAS total variance. These findings are compatible with the studies reporting the relation between anger experience quality and its expression ways with social anxiety.,,, It seems that expressing anger outside for the people having higher social anxiety can lead to real or imaginative risk of more negative evaluations. Hence, the anger can elicit anxiety and may be suppressed to decrease it. In fact, feeling discomfort with anger and its suppression, which are presented by hidden criticizing the others and experiencing the annoyance feeling, are all the characteristics of anger expression among the people suffering from SAD. Accompanying with previous studies,,,, the relation between perfectionism and social anxiety was affirmed in the present investigation. According to the findings of these studies, the more a person worries about making mistakes (COM), experiences doubt about the perfection of his/her own deeds, has a perception about his/her PC, the more he/she experiences fear and avoidance of social or functional situations. In the previous studies, PE, organization, and PS have been reported as the adaptive dimensions of perfectionism.,,,, This study also confirmed the results of the previous studies about organization and PS. However, it seems that the PE dimensions of perfectionism may have positive and negative aspects and may be connected with specific psychopathologies in certain conditions. However, it needs to be studied more. Among the subscales of FMPS, doubt about actions explains 22% of fear scores variance. The DA also alongside PC predicts 33% and 30% of the variance of avoidance scores and LSAS-total scores, respectively. The hesitation about personal ability for doing the actions perfectly and also criticism expectations and sensitivity to this can lead to fear and avoid social and functional situations. These two dimensions of perfectionism are related to different psychopathologies in most studies done in this field. They seem to form the central core of maladaptive perfectionism. According to our results, the people having over-awareness of others' behaviors and feelings, and also highly sensitive person, experience more fear and avoidance of social and functional situations. These findings can support the studies which affirm the role of interpersonal sensitivity in psychopathology of social anxiety.,,, It sounds that this personality characteristic has an important role in developing social anxiety and maintaining its symptoms. According to the results of multiple regressions, interpersonal awareness is the predictor of fear and the total score of LSAS and fragile inner self is the predictor of avoidance. Therefore, being aware and worried in the social interactions, the person high stress about the impact which he/she can put on others (interpersonal awareness), having a negative attitude toward oneself, fear of being ridiculous, and the need for others continually approval for self-reinforcing (FIS) may lead to fear and avoidance of social situations. The results of analyzing multiple regressions to study concurrent effects of variables in predicting the social anxiety showed that the higher levels of FMPS-total and IPSM-total scores predicted the greater fear of social and functional situations. Higher levels of FMPS-total alongside the lower levels of AX-Index also were associated with a greater avoidance score. Furthermore, FMPS-total clarified 15% of LSAS-total scores variances. Therefore, it seems that perfectionism can lead to both fear and avoidance of functional and social situations. However, interpersonal sensitivity only predicts fear, and quality of anger expression is only related to avoidance. IPSM-total score was also just the predictor of fear in Kumari et al. study. In fact, interpersonal sensitivity may create a general sensitivity or arousability which increases the sense of fear in social situations. In summary, according to this study, hesitation about perfection of the actions, fear of being criticized derived from PC, high sensitivity and awareness in interpersonal relations, having a negative attitude toward oneself, and experiencing anger alongside its maladaptive expression skills can lead to experience fear and avoidance of interpersonal and/or functional situations. It is suggested conducting the studies in which the relations between these variables with social anxiety are investigated in different communities and in larger samples. In addition, investigating and adjusting the effects of confounding variables such as gender or other demographic characteristics or personality traits can help to explain more and complete the findings of this investigation and previous studies. Flores PJ. Group Psychotherapy with Addicted Populations: An Integration of Twelve-Step and Psychodynamic Theory. London, United Kingdom: Routledge; 2013. Coping AS. Advances in the research of social anxiety and its disorder. Anxiety Stress Coping 2010;23:239-42. Sadock BJ, Sadock VA. Kaplan and Sadock's Synopsis of Psychiatry: Behavioral Sciences/Clinical Psychiatry. Philadelphia, United States: Lippincott Williams & Wilkins; 2011. Allport GW. Personality: A Psychological Interpretation. New York: Henry Holt; 1937. Berkowitz L, Harmon-Jones E. Toward an understanding of the determinants of anger. Emotion 2004;4:107-30. Moscovitch DA, McCabe RE, Antony MM, Rocca L, Swinson RP. Anger experience and expression across the anxiety disorders. Depress Anxiety 2008;25:107-13. Erwin BA, Heimberg RG, Schneier FR, Liebowitz MR. Anger experience and expression in social anxiety disorder: Pretreatment profile and predictors of attrition and response to cognitive-behavioral treatment. Behav Ther 2003;34:331-50. Fitzgibbons L, Franklin ME, Watlington C, Foa EB. Assessment of Anger in Generalized Social Phobia. In Poster Presented at the 31st Annual Convention of the Association for Advancement of Behavior Therapy, Miami, FL; 1997. Meier VJ, Hope DA, Weilage M, Elting D, Laguna L. Anger and Social Phobia: Its Expression and Relation to Treatment Outcome. In 29th Annual Convention of the Association for Advancement of Behavior Therapy, Washington, DC; 1995. Dadds MR, Gaffney LR, Kenardy J, Oei TP, Evans L. An exploration of the relationship between expression of hostility and the anxiety disorders. J Psychiatr Res 1993;27:17-26. Alden LE, Wallace ST. Social standards and social withdrawal. Cognit Ther Res 1991;15:85-100. Frost RO, Lahart CM, Rosenblate R. The development of perfectionism: A study of daughters and their parents. Cognit Ther Res 1991;15:469-89. Dunkley DM, Zuroff DC, Blankstein KR. Self-critical perfectionism and daily affect: Dispositional and situational influences on stress and coping. J Pers Soc Psychol 2003;84:234-52. Hewitt PL, Flett GL. Dimensions of perfectionism in unipolar depression. J Abnorm Psychol 1991;100:98-101. Heimberg RG, Juster HR, Hope DA, Mattia JI. Cognitive-behavioral group treatment: Description, case presentation, and empirical support. In: Stein MB, editor. Social Phobia: Clinical and Research Perspectives. Arlington, VA, US: American Psychiatric Association; 1995. p. 293-321. Shumaker EA, Rodebaugh TL. Perfectionism and social anxiety: Rethinking the role of high standards. J Behav Ther Exp Psychiatry 2009;40:423-33. Antony MM, Purdon CL, Huta V, Swinson RP. Dimensions of perfectionism across the anxiety disorders. Behav Res Ther 1998;36:1143-54. Juster HR, Heimberg RG, Frost RO, Holt CS, Mattia JI, Faccenda K. Social phobia and perfectionism. Pers Individ Dif 1996;21:403-10. Blatt SJ. The destructiveness of perfectionism. Implications for the treatment of depression. Am Psychol 1995;50:1003-20. Kumari RS, Sudhir PM, Mariamma P. Perfectionism and interpersonal sensitivity in social phobia: The interpersonal aspects of perfectionism. Psychol Stud 2012;57:357-68. Bitaraf S, Shaeeri MR, Hakim Javadi M. Social phobia, parenting styles, and perfectionism. Developmental Psychology (Journal of Iranian Psychologists) 2010;7:75-83. Liebowitz MR, Gorman JM, Fyer AJ, Klein DF. Social phobia. Review of a neglected anxiety disorder. Arch Gen Psychiatry 1985;42:729-36. Boyce P, Parker G. Development of a scale to measure interpersonal sensitivity. Aust N Z J Psychiatry 1989;23:341-51. Davidson J, Zisook S, Giller E, Helms M. Symptoms of interpersonal sensitivity in depression. Compr Psychiatry 1989;30:357-68. Harb GC, Heimberg RG, Fresco DM, Schneier FR, Liebowitz MR. The psychometric properties of the Interpersonal Sensitivity Measure in social anxiety disorder. Behav Res Ther 2002;40:961-79. Erözkan A. Investigation of social anxiety with regards to anxiety sensitivity, self-esteem, and interpersonal sensitivity. Elem Educ Online 2011;10:338-47. Vidyanidhi K, Sudhir PM. Interpersonal sensitivity and dysfunctional cognitions in social anxiety and depression. Asian J Psychiatr 2009;2:25-8. Wilhelm K, Boyce P, Brownhill S. The relationship between interpersonal sensitivity, anxiety disorders and major depression. J Affect Disord 2004;79:33-41. Liebowitz MR. Social phobia. Anxiety 1987;22:141-73. Baker SL, Heinrichs N, Kim HJ, Hofmann SG. The liebowitz social anxiety scale as a self-report instrument: A preliminary psychometric analysis. Behav Res Ther 2002;40:701-15. Levin JB, Marom S, Gur S, Wechter D, Hermesh H. Psychometric properties and three proposed subscales of a self-report version of the Liebowitz Social Anxiety Scale translated into Hebrew. Depress Anxiety 2002;16:143-51. Fresco DM, Heimberg RG. Empirically supported psychological treatments for social phobia. Psychiatr Ann 2001;31:489-96. Fresco DM, Coles ME, Heimberg RG, Liebowitz MR, Hami S, Stein MB, et al. The Liebowitz Social Anxiety Scale: A comparison of the psychometric properties of self-report and clinician-administered formats. Psychol Med 2001;31:1025-35. Atrifar M, Shaeiri M, Rasoolzade Tabatabaei K, Jan Bozorghi M, Azad Falah P. Effectiveness of group CBT using Hofmann pattern on decrease of symptoms from social anxiety disorder. Culture of Counseling and Psychotherapy 2012;9:23-50. (Persian). Mohammadian Y, Mahaki B, Fathali Lavasani F, Dehghani M, Atef Vahid M. The psychometric properties of the Persian version of interpersonal sensitivity measure. J Res Med Sci 2016;21:146. Frost RO, Marten P, Lahart C, Rosenblate R. The dimensions of perfectionism. Cognit Ther Res 1990;14:449-68. Spielberger CD. STAXI-2: State-trait anger expression inventory-2; professional manual. Lutz, Florida, United States: PAR, Psychological Assessment Resources; 1999. Khodayarifard M, Spielberger CD, Lavasani MG, Zardkhaneh SA. Psychometric properties of farsi version of the spielberger's state-trait anger expression inventory-2 (FSTAXI-2). Procedia Soc Behav Sci 2013;82:325-9. Asghari MA, Hakimirad E, Rezazadeh T. A preliminary validation of the psychometric characteristics of state and trait anger expression inventory-2 (STAXI-2) in a sample of university students. Daneshvar Raftar 2008;15:21-34. Rosser S, Issakidis C, Peters L. Perfectionism and social phobia: Relationship between the constructs and impact on cognitive behavior therapy. Cognit Ther Res 2003;27:143-51. Jain M, Sudhir PM. Dimensions of perfectionism and perfectionistic self-presentation in social phobia. Asian J Psychiatr 2010;3:216-21.